Still kicking after all these years. Bought new in 2001 and they sound as good as anything I've heard recently with my new Marantz and Outlaw Amp. I retired the Denon 2802 because it could not decode new formats and had no HDMI. None at the price I paid. I'm looking for the AR15 to buy but right as of this review some guy on eBay is selling them for nearly $300 so I don't think they are worth that since I could just wait for Chane Audio and get the Leaf ribbon tweeter for that price. However the AR17 never let me down... so many years later. Nice cabinet. Powerful, well controlled bass for small size. Good sound stage. Great for the first film. Dynamic. Harsh tweeter. Ouch. Thought there was a problem with the room. Can't listen to these long. Good small Home Theator speaker. Not a good choice for classical, jazz or even folk rock. There is just no taming this metal tweeter. Kef Q15.2, Kef 303, Kef Coda 9. So I bought these speakers without hearing them, and almost didn't - I heard a set of Paradigm Atoms and thought they were the greatest....until I got them home and listened to them in my house - they just didn't fill the room. I talked to Mark and Accessories4Less and he recommended the AR15 for fronts and AR17 for rear speakers - the best decision I could have ever made - these speakers tied to my Marantz SR7000 sound fabulous - even got the wife seal of approval! The 17s are very strong for surrounds and would be ok for fronts as well - just make sure you have a sub handy as they don't produce the low end as well as a tower would. The green tweeter is a cool effect as well - so I'm running a AR4C center - the AR15/17 setup and a PR1212 for a sub. Buy these if you get the chance - you won't regret it - they aren't as bright as the 17s but they do have the same soundstage and if you like bright tinny speakers then you shouldn't be getting these - go buy some Bose crap if you want high and tinny. Good luck! Can be a little too agressive - sharp sounds can be fatiguing. Good bass from just a 5" speaker. Good sound for the price. But not up there with the likes of B&W, or other english speakers. American speakers have a different sound - more slam than british speakers. Sound better with my Philips stereo amp than my Yamaha AV amp. Although the Yamaha amp costs much more than the Philips. I also have KLH, Altec Lansing (20years old), and JBL TLX speakers. The Ar17 can match up to them in terms of sonics. I purchased these speakers to audition the AR's and their new technology incorporated into the Hi-Res line. I find the sound of these live up to the 'tech talk' and then some. Sweet detailed highs from the diamond coated titanium tweets, and acurate midrange from the alloy 'monocoque' 5 1/4's serve up an accurate, flat frequency response. Stereo imaging is excellent with pinpoint placement and separation of instruments across the soundstage. The enclosures are weighty and well crafted with quality plated terminals. A terrific performance from such a small speaker. I love em!! I am very satisfied with these, even after going back and listening to other speakers after aquiring the AR's. These are now going into the back for surround duties, and I will be aquiring the AR-7's for front mains, and an AR2C for center. I am expecting great things from the AR7's with their D'Appolito array and dedicated 12" to handle freq's below 100hz. I have no doubt they will deliver. I talked about stereo usage above, these are outstanding in clarity and detail for home theater as well. I can't wait to complete my system with these speakers!! What a sweet speaker, for <$200 a pair or even twice that much. The magnesium/aluminum woofers and titanium tweeters really put out a smooth, detailed sound. Set them up correctly, mate them with a nice subwoofer (like the Acoustic Research ARS-300), play your favorite live music, and you are in the audience. Feed them rock, jazz, anything you like and they will please you. For home theater two pairs of these, an AR2C center, and an ARS-300 sub will make a Bose setup cry home to mommy, and you'll spend less money. I could't find a place nearby that carried the AR high-res series, so I tried them based on the great reviews here and at etown.com, and I definitely do not regret it. Cherry speakers have wonderful highs. I am a casual listener. I use these with my 100W Adcom -SAE amp/preamp combo. It sounds so much like Dexter Gordon is in my living room that I pay a cover charge each time I listen. I don't listen to much base heavy music, so it is difficult to evaluate the base fully for you. The speakers are very attractive and appear to be real wood. I bought them for $179 from 'At Your Service'. I had a bad experience with Tek Warehouse oredering a different speaker before I ordered these. When considering the AR-17s as bookshelfs they seem to work great. They need to be matched with a good solid subwoofer. Powered recommended. I use the AR S300. The two products seem to be well matched for my application. AR-17s recommended for the money. Great sound! very nice trebble! These are my first real speakers. I got these basically for my computer with hopes to eventually upgrade the system to a full entertainment center. All I have to say about these speakers is "WOW!" These are such a great value. The sound is amazing. I had to get used to the sound, because it was A LOT better than what I was used to. The highs are GREAT but not TOO sharp. I can turn the trebble all the way up and not feel like my head is going to explode when a symbol hits. 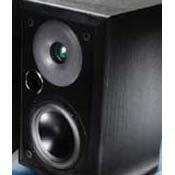 The bass on these speakers isn't great, but what do you expect from a bookshelf speaker? I've got a 12" Acoustic Research sub for the bass, and that takes care of it. I really recommend these speakers for beginers(like myself). I also recommend if you like bass to get a sub, it really helps. Also, I'd like to say I listen to a lot of hard rock/metal on these. It sounds great. So if you're considering these for that type of music, I don't think you'll be disappointed.